Lovely apartments with great views and nice pool area. The pool area was a little noisy from traffic but if you put music on you never heard it. Balconies on both sides of the apartments so you could sit in the sun or the shade and admire the view. Staff at the hotel in the square were very helpful. Staff at the apartments were lovely and kept the apartments clean. Lots of extras which was appreciated. Very friendly staff, clean rooms, fantastic sea views, lovely pool although close to the Road was not busy, fantastic cleaners, comfy and big beds, walking distance from square and restaurants. The whole accommodation was excellent - exceeding expectations. The maid was great wanting to clean the room daily. They even filled our fridge and left us coffee. The location is excellent with some of the best views I have experienced. There is a beautiful view of the sea on both sides of the property and also whilst sitting in the communal area by the pool. The local staff were very helpful and friendly and were very responsive with any issues raised. They could not have been more helpful. The apartment was very well equipped and spotlessly clean. The whole property is quite new so everything is in excellent working order and pristine/modern. The quality of the fixtures, fittings and furniture was excellent. The welcome pack of food and tea and coffee was appreciated by our whole group. The stunning view and cleanliness and beautiful interior! Owner on-site on arrival. Our original room was not ready so we opted to use a smaller apartment with free breakfast for duration of stay. The one bedroom apartment was plenty big enough for 2 people. 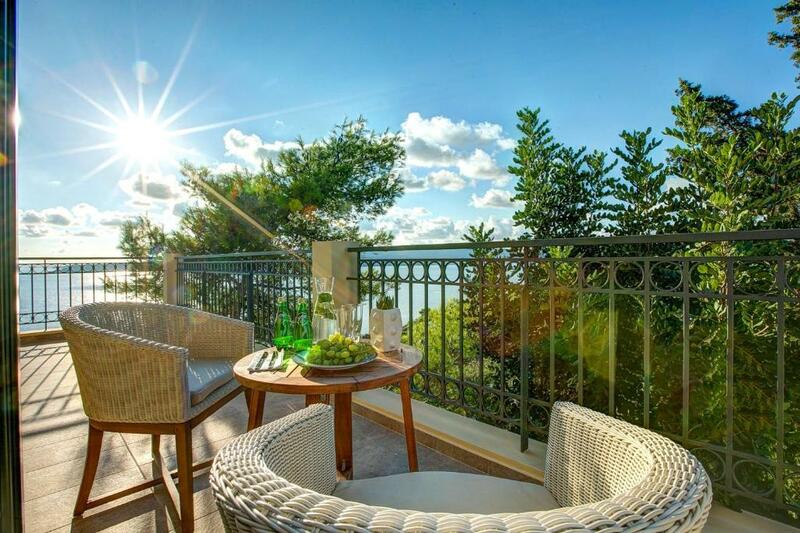 Apartment has 2 terraced areas to take advantage of the stunning views. Alles war super, besonders dier Lage und der Komfort. 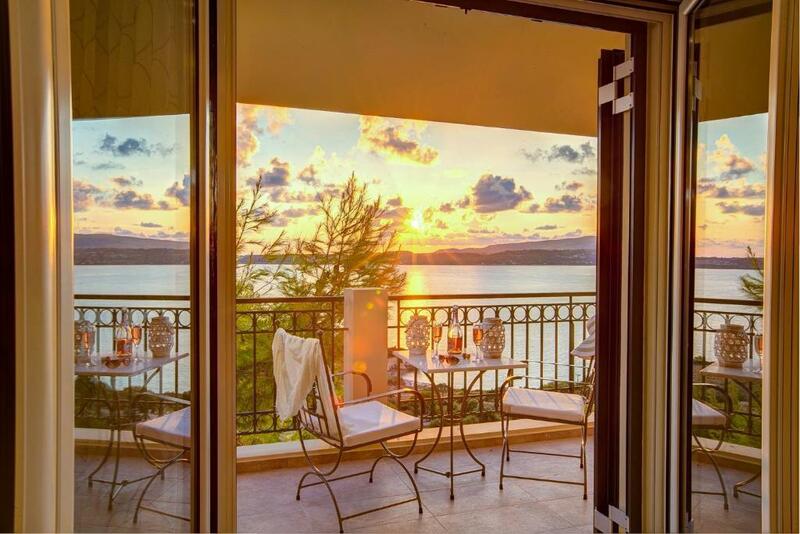 Lock in a great price for Ionian Vista – rated 9.6 by recent guests! One of our top picks in Argostoli.Offering an outdoor pool, year-round outdoor pool and barbecue, Ionian Vista is located in Argostoli in the Kefalonia Region, 2,300 feet from Korgialenio Historic and Folklore Museum. Argostoli Port is 0.7 mi from the property. Free WiFi is offered throughout the property. The accommodations is air conditioned and comes with a seating area with a flat-screen TV. Some units have a dining area and/or terrace. There is also a kitchen, fitted with a dishwasher and oven. A toaster and coffee machine are also provided. Free private parking is also available on site. Bed linen is available. Ionian Vista also includes a hot tub. The property also offers grocery delivery. Breakfast is served at the sister property, set 1,650 feet away. Fanari Beach is 1.6 mi from Ionian Vista, while Museum of Natural History of Kefalonia and Ithaca is 3.7 mi away. 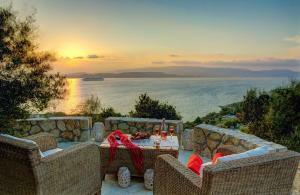 The nearest airport is Kefalonia Airport, 3.7 mi from the property. Free private parking is possible on site. 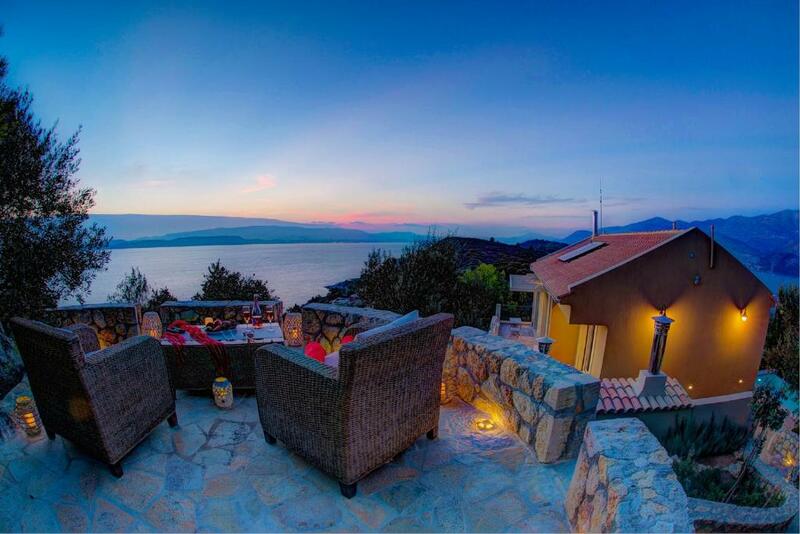 This property is also rated for the best value in Argostoli! Guests are getting more for their money when compared to other properties in this city. 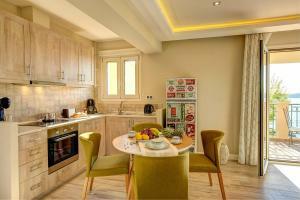 When would you like to stay at Ionian Vista? 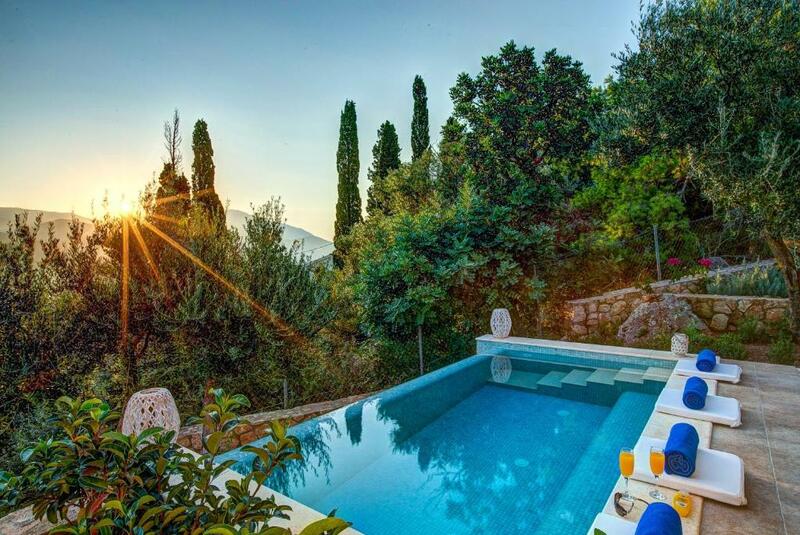 This villa has a balcony, private entrance and private pool. 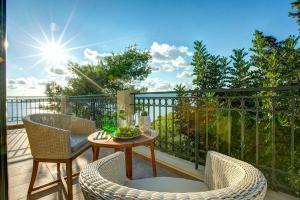 This holiday home features a balcony, executive lounge access and tile/marble floor. This apartment has a balcony, kitchenware and flat-screen TV. The best thing is that actually there is no neighborhood. You can have peace of mind! 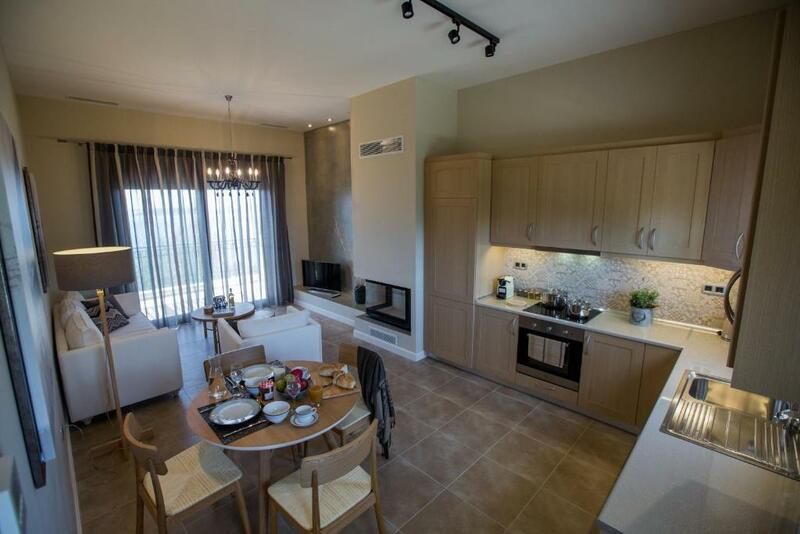 House Rules Ionian Vista takes special requests – add in the next step! Ionian Vista accepts these cards and reserves the right to temporarily hold an amount prior to arrival. Please inform Ionian Vista of your expected arrival time in advance. You can use the Special Requests box when booking, or contact the property directly using the contact details in your confirmation. A bit of a hike up and down the hill but a nice workout! Due to the accommodation,this has been one of the best vacations we have ever had in Greece, we spent a week and could not be happier. From the moment we stepped into Ionian Vista, while we were warmly welcomed by the manager, we felt it was the right choice and the pictures you see online are exactly what you get: the outdoor space is attractive with lots of plants and trees,quality furniture arranged around a beautiful pool and all the details of the construction are high quality. The property is perfectly located: close to Argostoli center ( few minutes drive) and to Lassi's beaches: steps away from all the action but protected at your own quiet hideaway. The views over the surroundings hills, harbour,bay and Ionian Sea are wonderful. 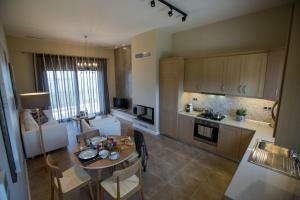 The apartment (#1) is spacious and luxuriously comfortable : everything is extremely clean, well kept and new. Smart TVs, full kitchen with utensils,refrigerator stocked with fresh food (breakfast items, water,fruit, etc),air conditioning you control, very comfortable beds, lot of attention to details. 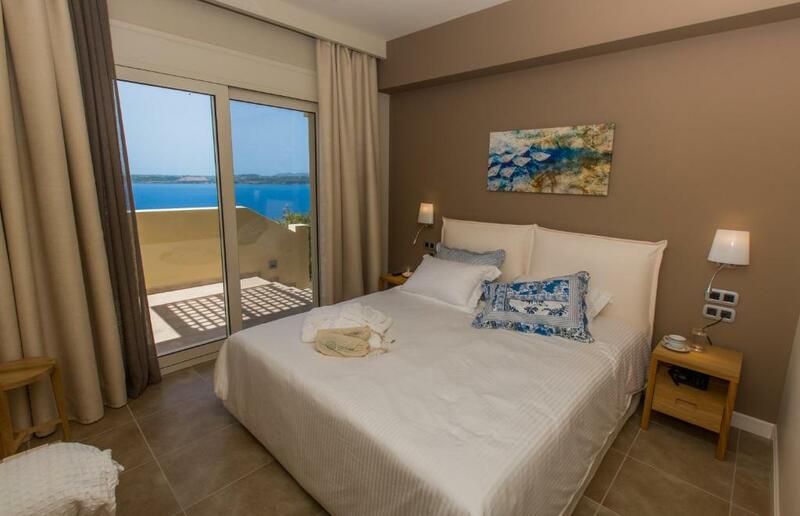 Superb facilities,free wi-fi,free parking,complimentary breakfast ( Ionian Plaza Hotel),laundry room, daily housekeeping and 24/h reception:everything you need they are able to arrange for you. We met the owner: excellent host that truly made our Kefalonia experience a home away home and our holiday even more special. Ionian Vista: what a place! As we arrived late we had to collect keys from Hotel (parent company). This was roughly 5 minuets drive away / 15 minutes walk. Thankfully we had a car so ok at night. Might not be great for those on foot and in the dark. Secondly, key for door did not work so we had to call hotel to have someone come to Villa. They responded very quickly and someone was with us within 10 minutes. If you arrive by taxi you have to get the key at the ionian plaza in the city center and take another taxi on the hill to ionian vista. it's not really bad but its good to know you have to take two taxi drives. The noise from the road when on the balcony although we realise this is unavoidable and couldn't be heard when inside. I rarely say this but I could not fault this property and I have traveled extensively in both my professional and personal life. There were more steps than we expected although that can't be helped due to location on a hill. A second bathroom would make it perfect, as our apartment was two bedroom and four women sharing one bathroom wasn't ideal but we managed with good organisation. No information at property to explain appliances, air conditioning or tv.